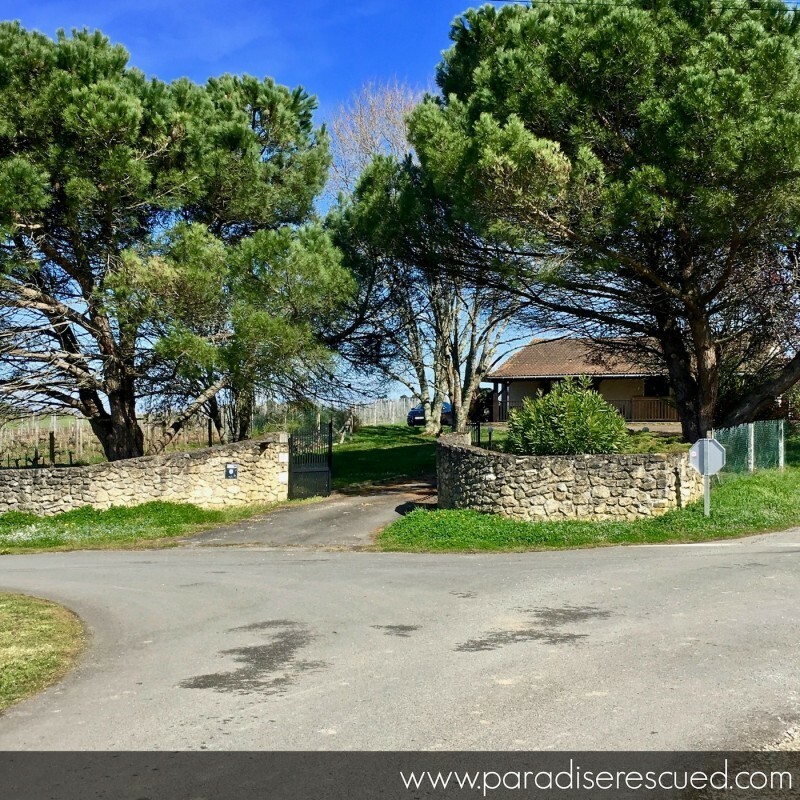 It’s a little hard to take in after such a long time, but finally it’s “doors open” for Paradise Rescued winery in Cardan Bordeaux! The beautiful new brand design bottles and cartons are stacked high on the pallets and our vigneronne Pascale is waiting to serve a tasting of our 2016 wines. It seems like this project has taken an eternity. Nine years after Pascale pruned our first vine in February 2010, the wine is finally home to the winery and on sale. As a couple of bottles nestle in between the maturing 2018 wine barriques, it feels right. 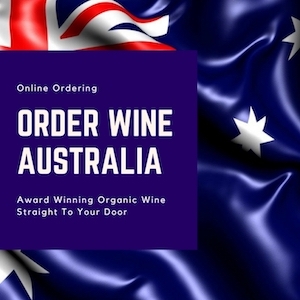 It’s back home in the winery proving why we did, why we work on a sustainability mission and how far and successfully we have progressed into the project. 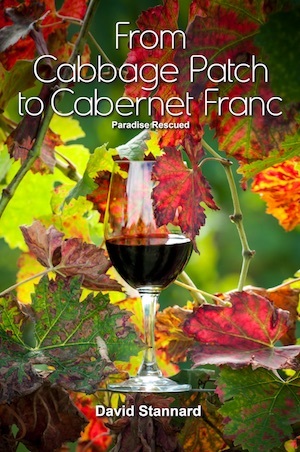 As you drive down the road towards the entrance to Paradise Rescued protected by the now two huge Pine trees on either side of the entrance way, between the houses of the Cardan community on the eastern side and the 12thcentury church across the small valley where the old centre of Cardan village once stood, lies the Paradise Rescued Cabernet Franc vineyard block. 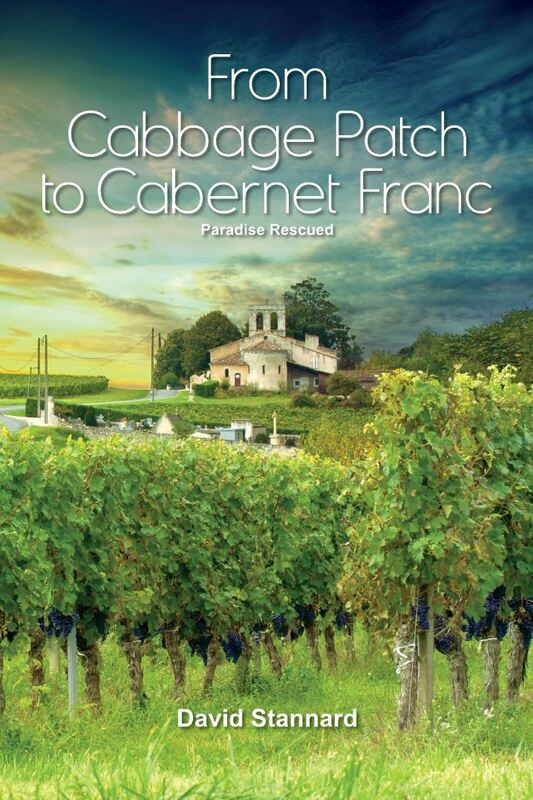 What was once seemingly a Cabbage Patch, has undergone an unimaginable transformation now producing the almost unique full varietal Bordeaux B1ockOne Cabernet Franc. 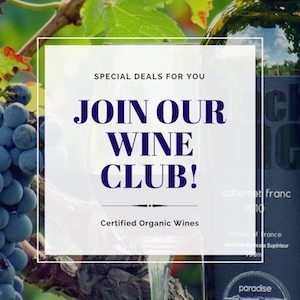 There are less than 10 full varietal Cabernet Francs produced in Bordeaux despite this esteemed wine region being the largest producing region of this grape variety in the world. As you drive through the gates and enter the tree shaded driveway into property, the Merlot vine block goes about its work to your left. The bottom tenth of a hectare is home to the 62 year old vines planted in 1957 after the killer frost of the preceding winter. Cut and death and abandoned back in 2011, this vineyard has been slowly lovingly restored to its former glory (or better). Adjoining it and stretching up the slope to the top of the plateau is the new Merlot block replanted completely in 2014 and coming fully onstream into production with the 2019 vintage. 75% of the new branded BlockTwo wine comes from this old / new vineyard with the balance made up from Cabernet Franc to provide a classic right bank Bordeaux blend. Following the drive round to the west of the property, the garage winery doors are open awaiting your visit and a tasting opportunity. Inside are the stainless steel micro cuvé vats – modern materials and new fashioned science are used in combination with hand crafted traditional wine making skills producing fruit forward high quality brightly coloured wines. The wine is matured in oak barrels in an adjacent barrique room for 11 months using oak barrels from 1 – 5 years of age / use depending on their performance. B1ockOne Cabernet Franc and BlockTwo Merlot Cab Franc overlook the vineyards at Paradise Rescued. The corks are pulled ready for your tasting. 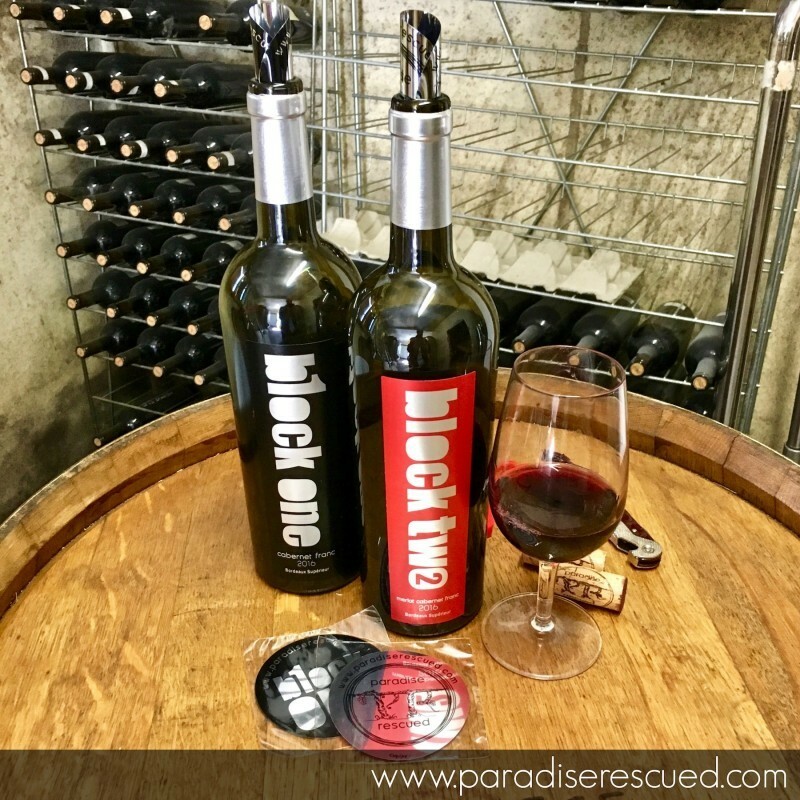 B1ockOne Cabernet Franc and BlockTwo Merlot Cab Franc with their designer labels by Tricia Wiles at Sweet Graphic Design are ready for you to taste. Our passionate vigneronne Pascale is waiting to explain / demonstrate how these vineyards and wine are organically (with EcoCert certification) managed / produced. A mission and vision to safeguard the natural heritage of the village of Cardan is gaining momentum. 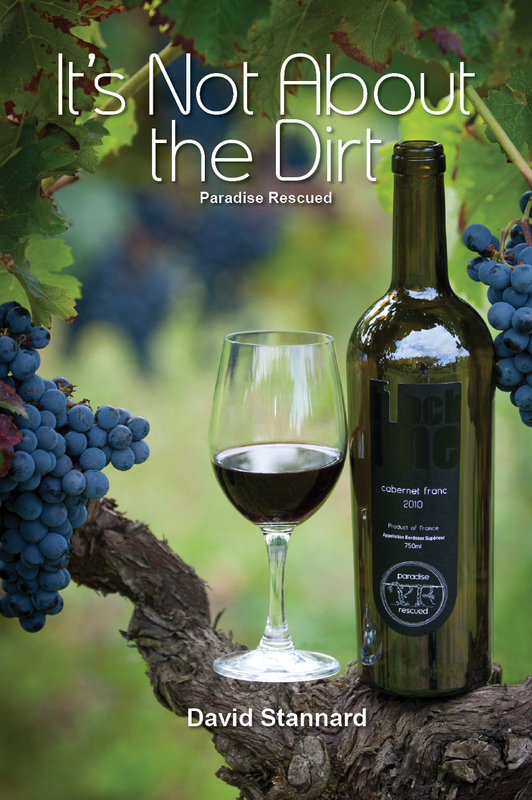 The Paradise Rescued micro vineyard and winery comprises less than an hectare of Cabernet Franc and Merlot vines. We would love to welcome you for a visit and tasting. Please make a booking via our listing on www.winalist.co to avoid disappointment and if our opening hours and availability do not fit your schedule drop us a line at finewine@paradiserescued.com so that we can try and work with your schedule wherever possible. We look forward to welcoming you to Paradise. When a purposeful mission, a clear bold vision and unrelenting passion collide, magic happens. Living locally in France? Passing through on travel or holidays? 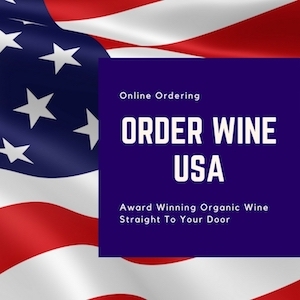 Book your reservation via Winalist here….